You live in France. You take medicine. You suffer from side effects and your doctor isn't listening. You can do something about it. Yes, you can! There is a form, but not an app, for that. an individual statement of activity time (13704*03 Relevé individuel de temps d'activité) - "Got up, went to the loo, had breakfast, had a shower, fed the cat...". There's no end to the fun you can have with a Cerfa. So, if you've had the flu vaccine and felt funny afterwards, if you've been taking pills and have come out in a nasty itchy rash, or something worse, don't suffer in silence thinking it'll pass. 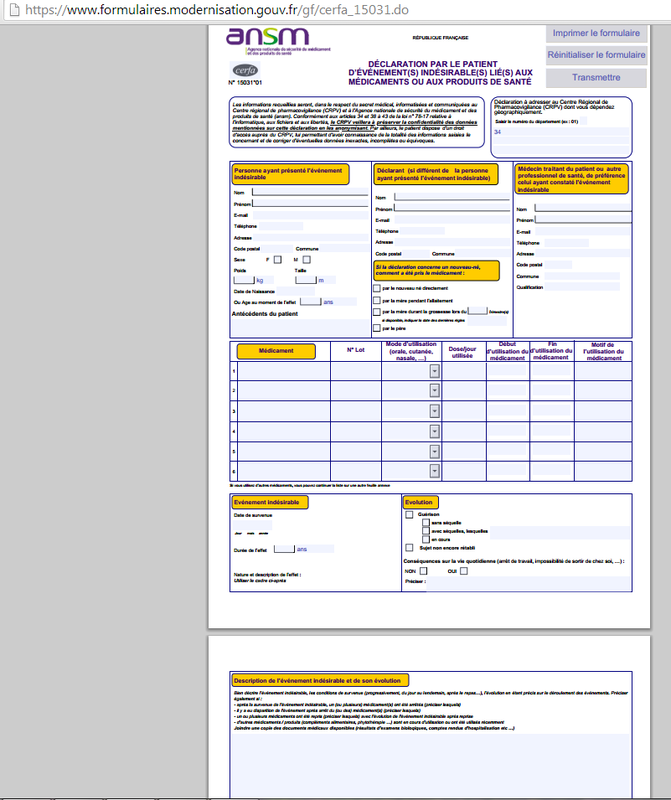 Get onto your computer, download the form, fill it in and send it off. You'll be doing us all a big favour! I'll have to ask the other half what happens here. He is up to his ears in forms so surely one of them must be for side effects. I'd be interested to know if there's a form for the public as well as one for professionals as there is here. Yes, I've my run in with a nasty drug. Only one though. And it's forever itched in my mind, and gut! Seriously, I don't believe I've ever puked so damn much in 24 hours. That sounds nasty, DD. Probably worse than your original ailment!